If you’ve been reading these pages for very long at all, you know that I’m a sucker for foreign languages, especially French. For over a year now I’ve been searching for “the perfect foreign language curriculum.” The conclusion I’m coming to is that it just doesn’t exist. However, Middlebury Interactive Languages comes pretty close. 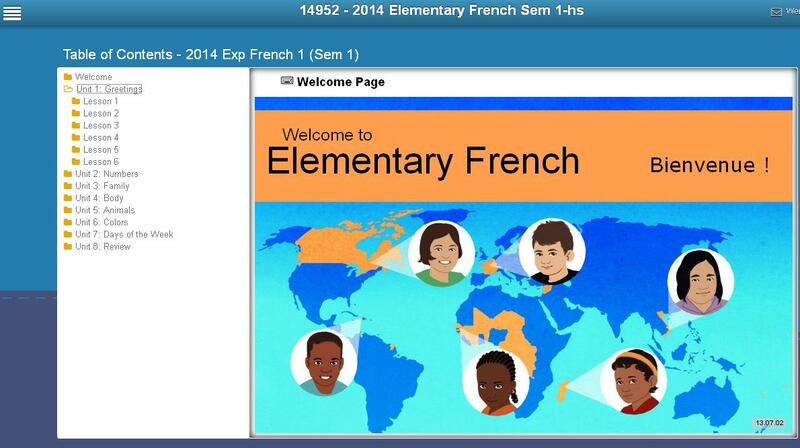 For the purposes of this review, we received a six-month subscription to their Elementary French 1 (Grades 3-5). As the product title suggests, this is designed for upper elementary students – roughly grades 3 through 5. 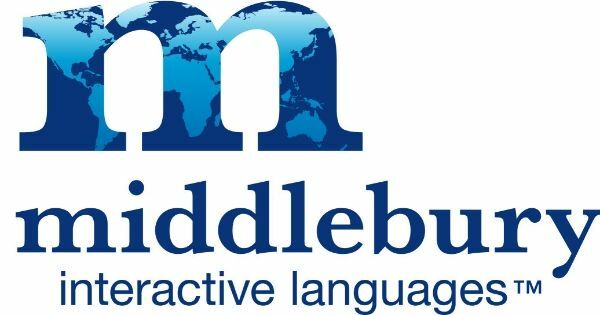 For this review, we were given several options of Middlebury courses – French, German, Spanish, or Chinese, each available in a variety of levels. It was a really tough call for me whether to start the boys with Elementary French 1 (which has no prerequisites) or Elementary French 2, which has the prerequisite of French 1 or equivalent. You know, of course, that we’ve been doing French off and on for a long time with the boys. But I wasn’t sure if the stuff they’d learned up to this point would be enough to qualify as “or equivalent,” so we went ahead and did Level 1. It turns out my boys already knew half of the material from this semester (greetings, numbers, body, and colors), so we probably would have been okay doing Level 2, but that’s okay. I don’t regret having chosen Level 1. My screenshot is a little small, but you can see on the left the different units. Click on the one you’re working on and it will take you right to the lesson. The world map shows all the different countries your language (French, in my case) is spoken. Each unit starts with a video. Middlebury is a (mostly) immersive program, so the video is entirely in French. 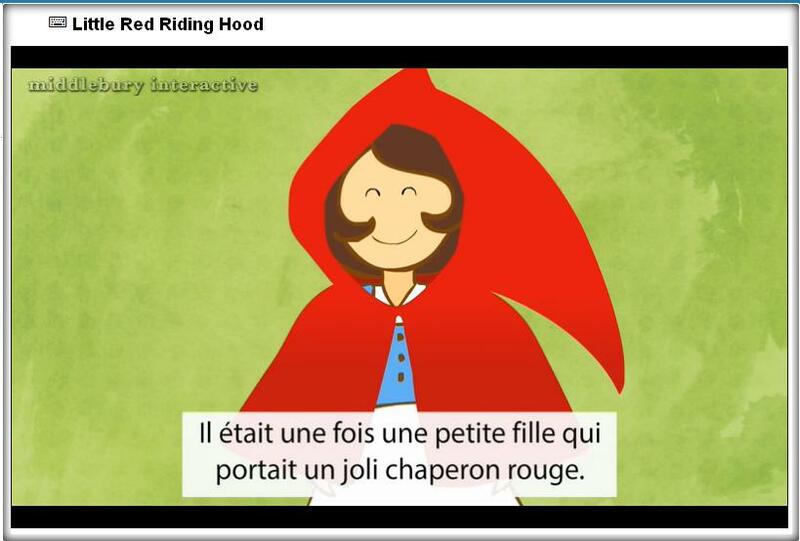 Unit 1: Greetings uses Le Petit Chaperon Rouge (Little Red Riding Hood) as its story. There’s a lovely female voice that reads the story to you, and there are captions – in French – to help you follow along. At no time is there an English translation of the story (except for the title). That’s where the immersion part comes in. 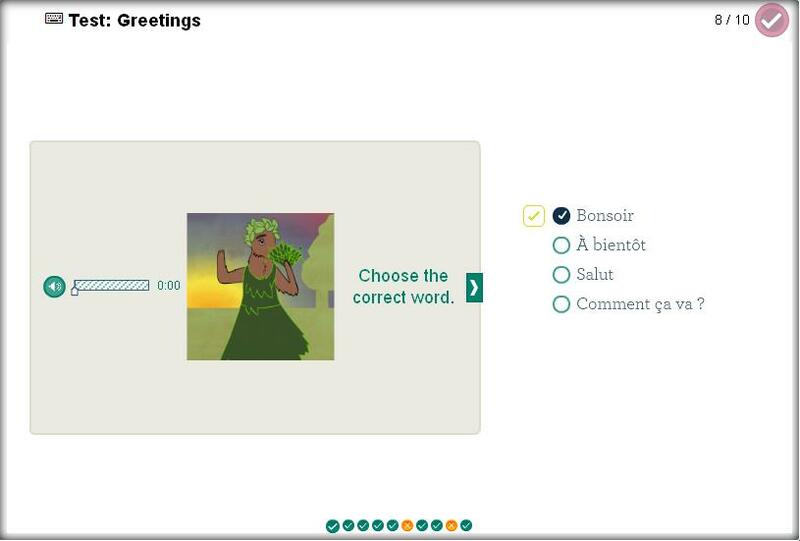 The questions in this lower level are in English, but the answers (multiple choice) are, of course, in French. After several levels of practice, including watching the video multiple times, there is a test. The picture corresponds to a scene in the story, and is shown throughout the practice sessions with a specific word or phrase. At test time, your student is expected to choose the right phrase from the list on the right. When you’re done, click the check mark in the upper right corner to have your answers corrected. The practice lessons can be cleared out and done as many times as necessary to achieve mastery, but the test can only be done once. Although we were only given access for one student, I had both Seahawk and Munchkin do this. The way we pulled that off was to all sit at the computer together and watch the video. Then when question time came, they would take turns answering. Because of the single-student nature of this review item, we weren’t able to go back and have them both do the tests (as noted above), but I would have them alternate which child answered a question. It is highly recommended (although not strictly necessary, especially if you – or whoever is the teacher – has some experience with the language) to have a microphone on your computer for use with this program. There are speaking exercises with each lesson that allow you (your student) to record your (their) voice and be graded for pronunciation. We don’t have one, so my kiddos had to just keep saying the word or phrase until I was happy with their pronunciation. Because most of what we’ve done so far has been review for them, it wasn’t too hard. As we get to the stuff they don’t know yet, I imagine it’ll take longer; I might even break out the webcam in order to have some sort of microphone for them to work with. I really liked this program. I thought it was really beneficial to have the boys hear a native speaker reading a story in French. That gives them something I can’t – fluency and accent. I like the combination of immersion and English. There’s just enough translation to keep the kids from getting frustrated while they learn.